Liu, W., Zhong, W. and Wargocki, P. 2017. Performance, acute health symptoms and physiological responses during exposure to high air temperature and carbon dioxide concentration. Building and Environment 114: 96-105. At its present concentration (~405 ppm), atmospheric CO2 poses no direct health threat to human or animal life. However, in a world where fake news seems to get more media exposure than the truth, unfounded rumor and false fears are spread that rising atmospheric CO2 concentrations are causing a host of human health-related maladies. While it is true that very high concentrations of atmospheric CO2 can produce a state of hypercapnia (Nahas et al., 1968; Brackett et al., 1969; van Ypersele de Strihou, 1974), or an excessive amount of CO2 in the blood, which typically results in acidosis (Poyart and Nahas, 1968; Turino et al., 1974), a serious and sometimes fatal condition characterized in humans by headache, nausea and visual disturbances, several studies of these phenomena indicate that they do not seriously impact human health until the CO2 content of the air reaches approximately 15,000 ppm (Luft et al., 1974; Schaefer, 1982), which is nearly 40 times greater than the current concentration of atmospheric CO2. So, we truly do not have to worry about any direct adverse health consequences of the ongoing rise in the air's CO2 content. The latest research study to confirm this fact comes from Liu et al. (2017). Among other things, this team of three scientists examined the performance, acute health symptoms and physiological responses of human subjects exposed to both ambient (403 ppm) and elevated (3025 ppm) atmospheric CO2. The experiment lasted 3 hours and was conducted in controlled environment chambers at a moderately-high room temperature of 35°C (95°F). In all, twelve human subjects were examined (six male and six female). Measured physiological parameters included skin temperature (on the left chest, right upper arm, left forearm, left hand, anterior thigh and anterior calf), eardrum temperature in the right ear, heart rate, blood pressure, end-tidal partial CO2, arterial blood oxygen saturation and body weight. Respiratory ventilation rate was also calculated, and biomarkers in the subject's saliva were measured to test for stress-related changes in their bodies. Additionally, the subjects were assessed for their "thermal sensation, thermal comfort, acceptability of the thermal environment, acceptability of the air quality, odor intensity, sleepiness, self-estimated work performance and the intensity of dry nose, dry throat, aching and dry eyes, and dry skin, as well as headache, difficulty in concentrating and thinking clearly, wellbeing, mood, fatigue and dizziness." And what did these analyses reveal? Not surprisingly, when all was said and done, the authors report that "increasing [the] CO2 concentration to 3000 ppm at 35°C did not cause changes in any of the measured responses." They did note, however, that the heart rates of the subjects were slightly reduced under elevated CO2 conditions (Figure 1, top left panel), although these reductions were not statistically significant. We thus have the additional evidence from Liu et al. that elevated CO2 presents no direct health risk to humans over and beyond the range of CO2 values that are predicted to occur from the continued combustion of fossil fuels in the future. Figure 1. 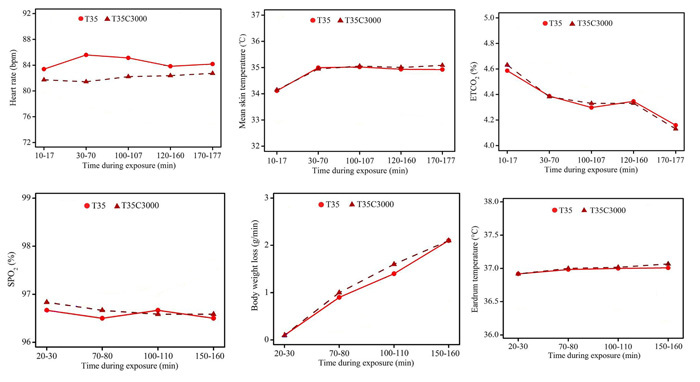 Physiological measurements (averages) at 35°C under ambient (T35) and elevated (T35C3000) CO2 conditions and at different times during experimental exposure. SPO2 is arterial oxygen saturation. ETCO2 is end-tidal partial CO2 pressure. Adapted from Liu et al. (2017). Brackett, N.C., Jr., Wingo, C.F., Muren, O. and Solano, J.T. 1969. Acid-base response to chronic hypercapnia in man. New England Journal of Medicine 280: 124-130. Luft, U.C., Finkelstein, S. and Elliot, J.C. 1974. Respiratory gas exchange, acid-base balance, and electrolytes during and after maximal work breathing 15 mm Hg PICO2. In: Carbon Dioxide and Metabolic Regulations. G. Nahas and K.E. Schaefer (Eds.). Springer-Veriag, New York, NY, pp. 273-281. Nahas, G., Poyart, C. and Triner, L. 1968. Acid base equilibrium changes and metabolic alterations. Annals of the New York Academy of Science 150: 562-576. Poyart, C.F. and Nahas, G. 1968. inhibition of activated lipolysis by acidosis. Molecular Pharmacology 4: 389-401. Schaefer, K.E. 1982. Effects of increased ambient CO2 levels on human and animal health. Experientia 38: 1163-1168. Turino, G.M., Goldring, R.M. and Heinemann, H.O. 1974. The extracellular bicarbonate concentration and the regulation of ventilation in chronic hypercapnia in man. In: Carbon Dioxide and Metabolic Regulations. G. Nahas and K.E. Schaefer (Eds.). Springer-Verlag, New York, NY, pp. 273 -28 1.